An adult wild turkey in the Red Quarry. I think I’m beginning a rather disturbing habit of quoting song lyrics and lines from movies in these posts. Slap me if I get out of hand. 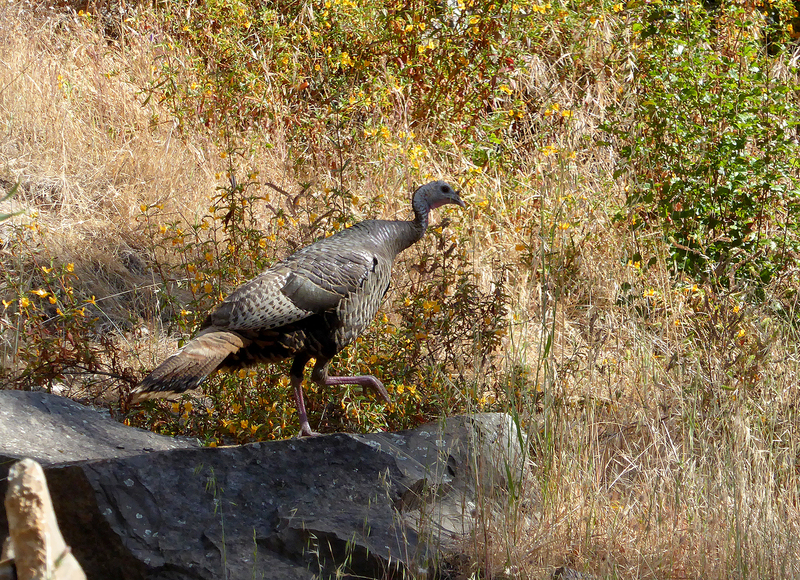 Wild turkeys are common sights on the Montini Preserve and the Sonoma Overlook Trail. Just the other day I spotted a flock of parents and young ones in the Red Quarry on the Montini Open Space Preserve. But I’ve also seen wild turkeys many times before, including during a rainstorm. Although definitely not widespread in California (according the California Department of Fish and Wildlife, they occupy about 18 percent of the state), wild turkeys are fairly common in Sonoma County. I live in the hills of Boyes Hot Springs and we have seen them in the neighborhood not all that far from the Montini Preserve. The turkeys we have in California can be considered non-native, although turkeys existed in California some thousands of years ago. So technically, as at least one person has argued, they can be considered to be “reintroduced” to the state. They can become a nuisance to humans at times if their populations increase enough, but so far I would have to say that they don’t seem to have reached such levels locally. At least from my experience the times that I have spotted them have been few enough to be surprising and delightful. But even if such sightings were not happy occasions, wild turkeys would never be able to drag me away from the Montini Open Space and Sonoma Overlook Trail. Just sayin’.